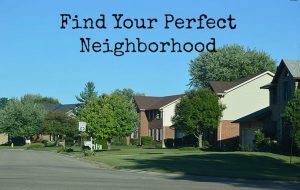 In a continuing look at the process of buying a home, today we are looking at how to find a neighborhood in which you want to live. This is important. You buy a home, but your neighbors come with it. You want to feel comfortable, safe, and part of the greater community. I would like to offer a few tips you can use to really get an idea of what is going on in any neighborhood. First, spend time there. Drive through it at different times of the week- rush hour, weekends, when school lets out, evenings. Stop by the local coffee shop, gas station, or sandwich shop. Do you feel comfortable there? Different people have different needs when it comes to safety, security, and comfort so it’s important for you to check this out on your own and not rely on your friends, your family, or even your Realtor to tell you where to live. Talk to the neighbors, if you can. Most neighbors are happy to discuss the pros and cons of the neighborhood. Get an overview of neighborhoods through multiple different websites such as NeighborhoodScout, WalkScore, or the neighborhood website or Facebook page, if possible. Talk to cashiers, vendors, and owners at local businesses to find out their impressions. Also, don’t hesitate to talk to local police departments about crime stats in the neighborhood. All neighborhoods have crime, but each neighborhood has it’s own blend of crime and only you can determine what makes a neighborhood safe to you. Want to discuss the details? Teri Lussier, THE HOME GROUP REALTY, 937-478-7781. See the other 10 Steps To Buying a Home, here.